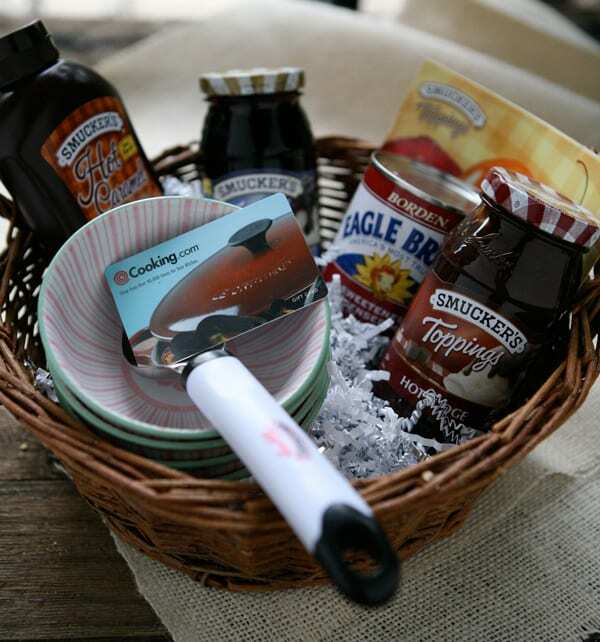 I’ve got a really fun giveaway today from Smucker’s. It includes everything in the basket above. There’s a set of 4 incredibly cute inside out Anthropolgie bowls in pink. There’s Smucker’s toppings in hot fudge, blueberry and caramel. There’s also condensed milk to help make some homemade ice cream and a Smucker’s ice cream scoop. And did I mention a $75 gift card to Cooking.com? There you can get an ice cream maker, or anything else to help you make that perfect scoop. To celebrate summer, Smucker’s is sharing 94 Days of Summer Tips, where you can find lots of tips and recipe ideas to make your summer fabulous. You can also follow Smucker’s facebook page to keep up to date on all the new tips and recipe ideas. To enter the giveaway tell me in the comment section below your favorite flavor of ice cream. For an extra entry, share this post on facebook, and leave a comment saying you did. For one more entry, retweet this giveaway. Contest closes Sunday (August 21, 2011) at midnight. I don’t think I’ve ever met a flavor of ice cream that I haven’t been able to love. I’m vegan so now I eat only dairy-free ice cream…one of my favorites being cherry fudge. Yumm! Great give-away! Great giveaway Angie! I love all kinds of ice cream but coffee is currently the front runner for my favorite. That’s a hard one! My ALL-TIME favorite is Chocolate Peanut Butter (The one with the peanut butter swirls in it from Baskin Robbins) and I’m on a real Mint Chocolate Chip kick right now…the one with chocolate chunks in it. Yum! Thank you for the giveaway Angie! I like all flavors, but vanilla is still my favorite. You can use any kind of toppings with it. My favorite ice cream flavor is hands down cookie dough! Never gets old! Butter Pecan! But I LOVE all flavors of ice cream!! Sweet giveaway! My favorite flavor of ice cream has to be rich chocolate with brownie bits… it’s delicious! My favorite flavor of ice cream is chocolate fudge brownie! I love Spumoni, but don’t find it very often in my area. Definitely chocolate. I do venture to different flavors but always come back to classic chocolate icecream! I love chocolate peanut butter! Bluuuuueberry! Best homemade ice cream by far! Jamoca-almond-fudge … gotta have that coffee!! I shared on FB with my username Mary Happymommy. Key lime ice cream with a graham cracker swirl! Praline and Cream is my very favorite ice cream. Chocolate!!! Or any variation of it. My favorite ice cream is butter pecan. Although, I just recently tried the same flavor at a local FroYo place and have to admit it is pretty amazing! I have 2 favorites so I couldn’t choose between them! Cherry and Coffee! my fav ice cream flavor is chocolate chip cookie dough! I can only pick one? I am a total ice cream – a- holic, but I guess if I have to choose, it would be creamy cookie dough! My favorite ice cream is coffee!! Fresh strawberry or peach ice cream is my favorite. I just really love vanilla, I always have and always will. I would say something on the herby or savory side….basil is sounding tasty right now! my favorite ice cream is a local flavor from my hometown- Chico Mint. Homemade choc ice cream with green pieces of homemade mint candy from the ice cream shop! Chocolate Ice Cream will always be my favorite!!! Chocolate Peanut Butter oh baby! It’s hard to come by knowledgeable people for this topic, however, you seem like you know what you’re talking about! What’s up, of course this paragraph is in fact fastidious and I have learned lot of things from it regarding blogging. thanks.